Sharks are known for their predatory prowess, thanks in no small part to their notoriously high tooth count. Sharks can have dozens of teeth at a time and go through thousands in a lifetime -- and without teeth like theirs, they wouldn't be as skilled at eviscerating prey as they are. Though the types of teeth they have may vary by species, a shark's pearly whites generally come in large numbers and make short work of their foes. 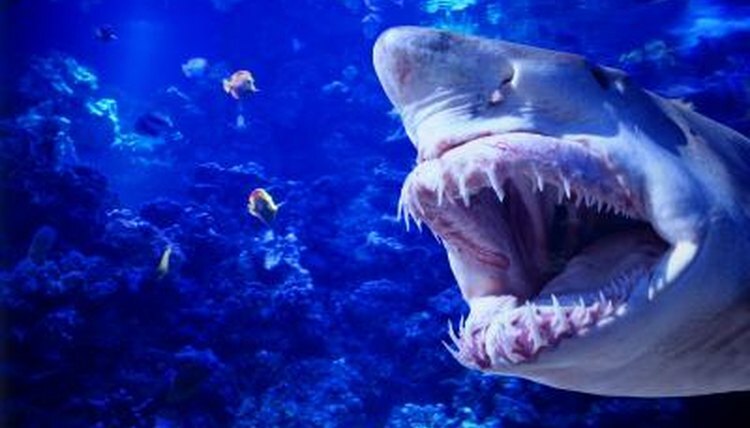 Human teeth have roots that keep them firmly planted in our gums, but sharks do not. Because their teeth aren't rooted, they don't last long -- they frequently fall out, sometimes lasting only a week to 10 days. To make up for it, these creatures are able to constantly grow new teeth, which sprout up to take the place of the ones that fall out. The new teeth are ready and waiting to emerge, so when a tooth is lost, a new one can take its place in as short a time as 24 hours. Not all sharks have the same type of teeth. For example, some have teeth that are long and narrow, like needles, which they use like spears for catching fish. Other sharks have teeth that are thick and hard as pavement, perfect for smashing and grinding up hard-shelled prey. Perhaps the most easily recognizable teeth, however, are those found in species like the great white, which are razor sharp, with serrated edges that easily rip apart prey. While most humans only have one row of teeth in each jaw, sharks have many more. They can have between five and fifteen rows in each jaw, all of which work to ensnare and chew up their food. Generally, the outermost rows have the largest teeth, and the teeth get smaller as you go further into a shark's mouth. Teeth may also move throughout the mouth, because they're attached to the skin instead of embedded with roots -- teeth in the back row eventually make their way to the front as others fall out. Ultimately, the number of teeth in a shark's mouth depends on the species. For example, great whites may have about 50 at a time, while whale sharks can have hundreds. Because of the rate at which teeth fall out, a shark can go through more than 30,000 teeth over the course of a lifetime -- without the ability to replace his teeth so frequently, he wouldn't be able to bite and destroy his prey with the strength and ferocity for which he is known. UCSB Science Line: How Many Teeth is a Shark Supposed to Have?